I led a music-making group at a nursing home in one part of Kansas City. It went great! Everyone was really clicking with the music, playing drums and singing while I played guitar, and they all seemed to be enjoying our discussion about baseball and the All-Star Game to be played in Kansas City last night. After the music ended, I finished my documentation, chatted for a moment with the activity director and the receptionist, then let myself out the door, loaded up my equipment in the back of my car, and drove off to another part of the metro for a business lunch. I don’t have my guitar. It didn’t take long for me to figure out that I had left my guitar at the first nursing home. I called them to confirm that it was still there, which it was, safe and sound. I led my music therapy session at the assisted living home using hand percussion instruments and body percussion, which, incidentally, led to some interesting and out-of-the-ordinary musical interactions. I then rescheduled my next session so that I could pick up my guitar before my last appointment of the day. Everything worked out fine. People were understanding, and no one accused me of being a horrible person or ruining their day. Be forgiving of your own forgetfulness. This was the lesson of my experience today. As much as we’d like to avoid them, memory slips happen to all of us. This is true even for those of us who have taken on the responsibilities of caring for loved ones. Research has demonstrated that stress and sleep deprivation can lead to forgetfulness. Both of those are common experiences for caregivers*. So, you might forget a doctor’s appointment or neglect to change the laundry from the washer to the dryer. Maybe you don’t remember your grandson’s birthday until a week late. Don’t beat yourself up over these mistakes, saying, “I shouldn’t have forgotten that!” You can be forgiving of your forgetfulness. Instead, if you start forgetting things frequently, take that as a sign that you might need to ask for some help with your caregiving responsibilities so that you can take time to rest and restore yourself. You may also need to be forgiving of your own forgetfulness if you are in the early stages of Alzheimer’s Disease. Memory slips are a common symptom in the early stages, and they can be very frustrating for a person who has always been able to rely on their own memories. Memory lapses can also be a result of a stroke, TBI, or other neurological impairment. You might find it hard to locate the right word for what you want to say, or you might forget where you left your keys or whether you fed the cat. As frustrating as it is, you can be forgiving of your forgetfulness. Forgetfulness is a symptom of your illness, not a reflection of your moral character. Instead, talk with your physician about your memory problems to ensure that you have a proper diagnosis and that medications are not contributing to the problem, then take steps to make sure that you stay safe as the disease progresses and your forgetfulness gets worse. All of us forget things from time to time, but the world keeps spinning. Caregivers under a lot of stress and people dealing with neurological impairments and dementia may experience more memory lapses than what has been their norm, but steps can be taken to minimize any harm that could come from a forgetful mistake. Either way, forgive yourself when you forget something. You deserve it. * You can read another personal reflection on the stresses of caregiving (and feeling guilty about feeling stressed) in this post. Powerfully written, Rachelle. Forgiving ourselves can always be difficult. But, as you said, we deserve it. Thank you, JoAnn! Yes, self-forgiveness is a struggle for a lot of folks, myself included. That it is! Thanks for your comment, Nikhil. Thank you for your thoughts. As a busy music therapist and caregiver of my 92 year old mother, I need to be more forgiving, for myself and her! Yes, please do be forgiving of yourself and your mom! We all need to give ourselves a break sometimes. Yes, my memory slips have increased with parenting. Thanks for your comment! I think that one of our most important self-care tools can be a generous application of self-compassion. It helps to remember that we often give ourselves more to do than is reasonable. 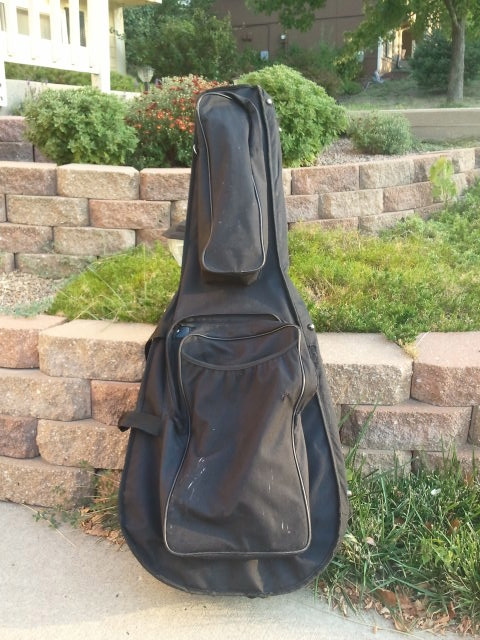 I’m glad that you were able to safely recover your guitar and also that you were able to turn this experience into a caring offering to yourself and others. Thank you, Ann. It is so true that we often expect more of ourselves than is reasonable, and we all need to be more compassionate with ourselves and others. Rachelle, Thanks for the reminder that we all need grace and forgiveness-even (sometimes especially) from ourselves. So true. Thanks for stopping by, Barb! Great reminders for all of us! I am a music therapist too (haven’t practiced in many years though) but am a caregiver and expert for AARP and write caregiving blog there. Glad to have found your blog too! Thanks for the reminder. We do expect too much of ourselves at times. We need to be reminded that a part of self care is forgiveness of ourselves. Very true! Thanks for your comment, Arlene.